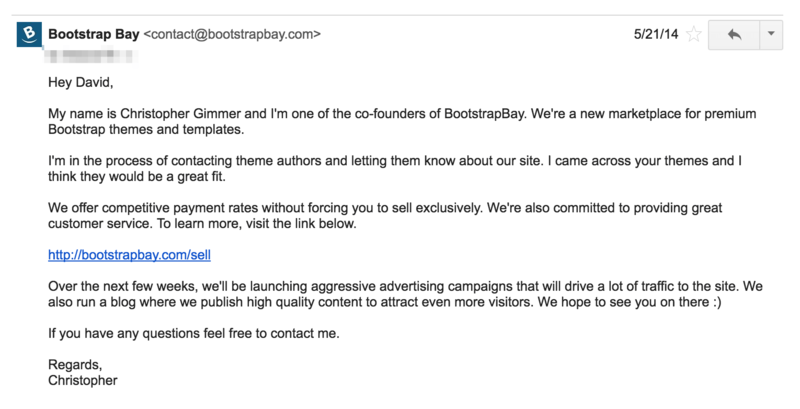 *Note: BootstrapBay has been acquired by Creative Tim. I no longer have any involvement with the website. Since launching BootstrapBay in April 2014, we’ve managed to sell over 10,000 themes and generate over $150,000 in revenue. 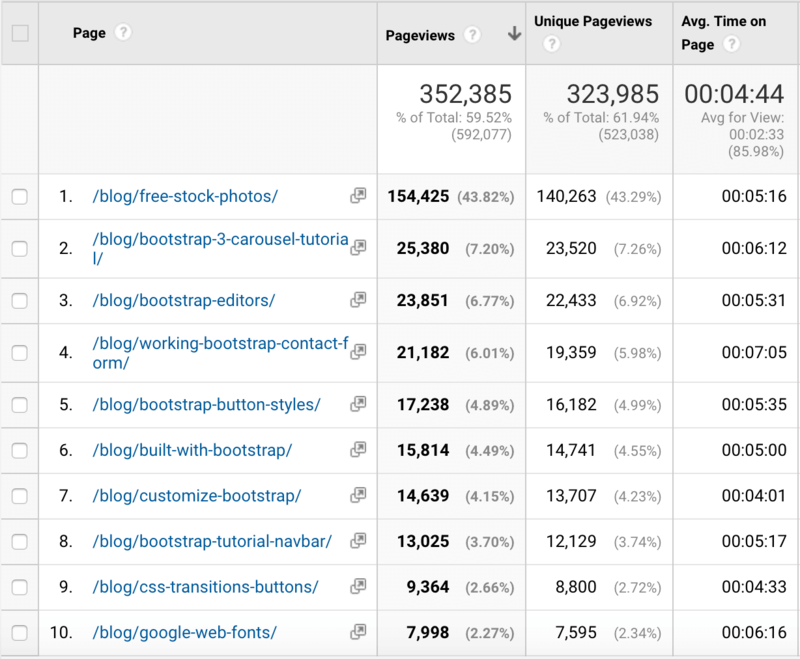 We also grew our blog traffic to 350,000+ monthly page views. Although we’ve moved on from the business to work on Snappa, it enabled me to quit my day job and go all-in on entrepreneurship. 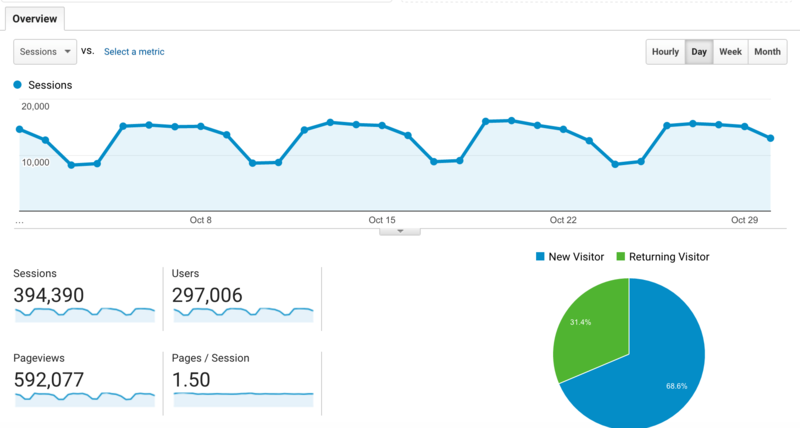 Here’s a screenshot of our traffic before we put the site on autopilot. A marketplace is generally something you don’t want to start without any funding. Generating demand and supply at the same time is hard. Nevertheless, we made it happen with pure hustle. 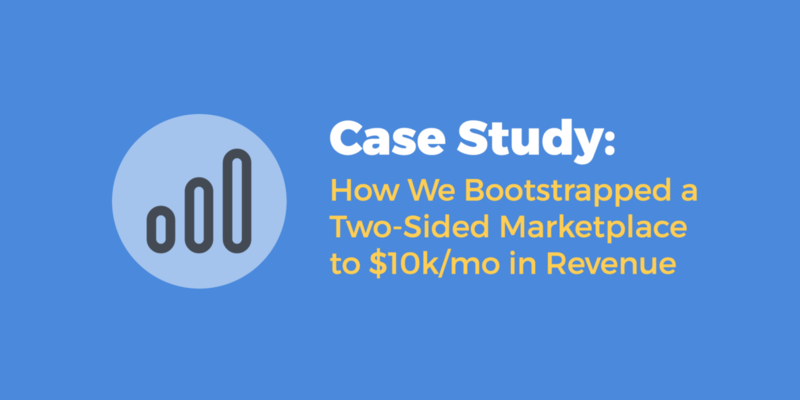 In this case study, I’ll be sharing exactly how we built and grew the business. In Part 1, I’ll cover how we validated the business to make sure the demand was there. In Part 2, I’ll cover how we went about building the marketplace and seeding the supply side. In Part 3, I’ll cover all the marketing strategies we used to grow the marketplace. Failure to validate a business idea is one of the most classic mistakes made by beginner entrepreneurs. Trust me, I should know. Before launching BootstrapBay, we attempted to start a student dating website called ClassmateCatch. Unfortunately, it became clear after launching that it wasn’t going to work. Determined not to make this mistake again, I wanted to make sure that the next business we started was something people wanted and were willing to pay for. Around this time, I started learning everything I could about online marketing and SEO in particular. One thing that became extremely useful was estimating search volume traffic. Using the Google Keyword Planner, you can determine how many times a given keyword is being searched. This gave an incredibly good proxy for how much demand you could generate for your business just from organic search alone. Armed with this knowledge, I started thinking about all the products and digital goods we could sell online. Eventually, I got a call from Marc (my business partner). 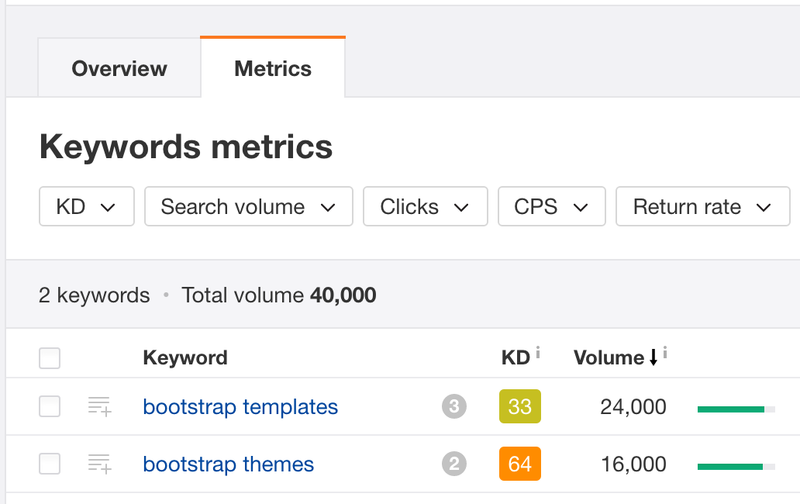 While playing around with the Keyword Planner, he discovered a bombshell shell of a keyword: Bootstrap templates. *Note: When we originally did this keyword research, Google used to provide the exact number of searches. Unfortunately, they no longer provide exact search results unless you’re spending a decent amount of money on AdWords. As you can see, the search volume was clearly there. Another thing to note is that this doesn’t even consider long-tail keywords. For example, people might be searching for “Bootstrap business templates” or “Bootstrap admin templates”. It’s fairly safe to say that the primary keyword only makes up about 10% of the total search volume you can expect for that term. So, in the case of Bootstrap templates, we could expect at least 240,000 monthly searches (24,000 / 0.1). One last thing that we did was check whether or not our particular keyword is trending or declining. 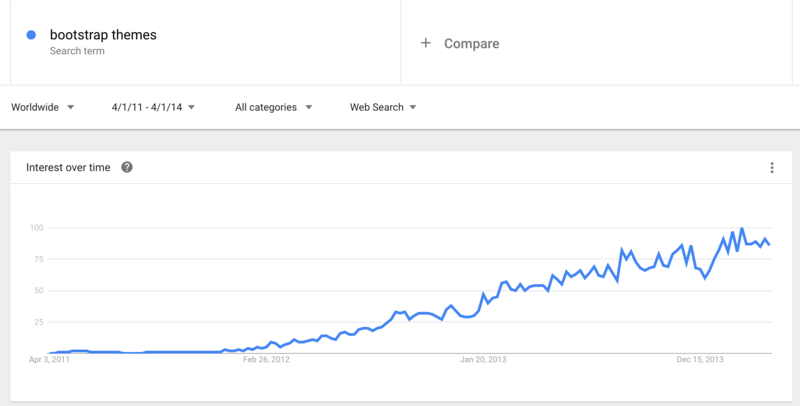 With a quick search in Google trends, we could see that Bootstrap themes and templates were definitely on the rise. Marc being a developer could also vouch that Bootstrap was a growing community. Now that we knew the demand was there, it was time to look at the competition. After all, big search volumes mean nothing if the competition is fierce. 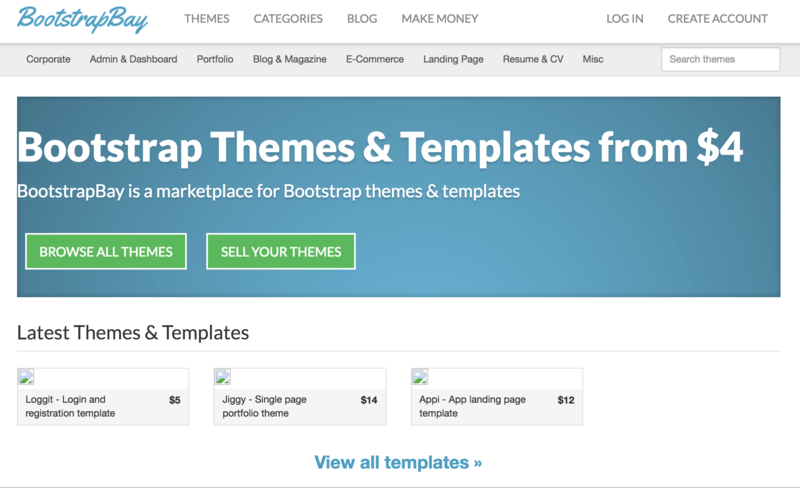 When we plugged the terms Bootstrap themes and templates in Google, we noticed that there was only one dedicated marketplace for these types of templates. The rest of the search results on the first page were mostly free resources. Even ThemeForest, which is the biggest marketplace for website themes, wasn’t even ranking on the first page at the time. This is mostly because they weren’t optimized for those keywords. At this point, we were fairly confident that we could create our own marketplace that could compete with the one and only dedicated marketplace for Bootstrap themes & templates. Side note: I would not advise going up against a marketplace that is already established and has both supply and demand figured out unless you truly have a unique angle. Now that we were confident a market for Bootstrap themes and templates existed, we went ahead and built the website. Here is where we made another classic beginner entrepreneur mistake… we didn’t do ANY marketing before launching. Instead, Marc worked furiously on nights and weekends to build the marketplace while I waited for the site to be built. A couple months later, Marc’s hard work paid off and the website was ready. Except… we had no one to launch it to. Another issue that we faced (which is the reason why marketplaces are so hard) was the fact that we had no theme authors lined up for the initial launch. The whole idea of a marketplace is to connect buyers and sellers. Unfortunately, we had no sellers to connect the buyers to. Thinking like scrappy bootstrappers, we came up with a plan. Marc was going to create the first batch of themes to list on our marketplace. However, we weren’t going to list them under our own name. After all, what kind of marketplace would it be if the only themes listed were created by the site owners? Instead, we invented a theme author. His name was Erik Stevenson and he originated from the Netherlands. At the time, we thought it was pretty hilarious. In fact, we still do. Thanks to “Erik”, we launched BootstrapBay with 3 themes. This was critical so that a) we had products to sell and b) we could hopefully convince others to list. After launching, the main goal was to get more people to list their themes with us. If you talk to other people who’ve built marketplaces, they’ll typically tell you to focus on one thing first. In our case, we knew it made more sense to focus on supply first. Otherwise, there would be very little value for the buyers. Recruiting theme authors to list on our marketplace was nothing but pure hustle. We combed through every marketplace that existing and looked for anyone that was selling themes on their own websites. We probably sent over 100 emails to potential theme authors. Not the greatest pitch in the world, but it got the job done. Slowly but surely, were able to convince more and more theme authors to list with us. As you can imagine, the more listings we got, the easier it became to convince people to list. 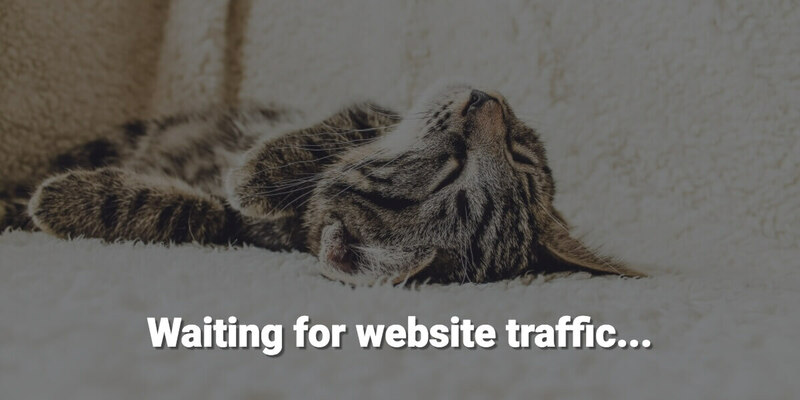 Once we were getting enough traffic to the site, we stopped manually recruiting people altogether since everyone started coming to us. Side note: We realized early on that all of the best theme authors tend to list their themes exclusively with existing marketplaces. That’s because theme authors who list their themes exclusively on marketplaces like ThemeForest earn a higher commission. This is the reason that BootstrapBay never grew beyond a 6 figure business. We simply didn’t have the quality of themes in order to compete with some of the other marketplaces. At this point, we had a website and a decent amount of listings. Now it was time to drive traffic and generate sales. Content marketing has a lot of advantages. For one, it’s an upfront investment that continues to pay off over time. If you get one of your blog posts to rank, Google will continue sending you traffic as long as the blog post is relevant. Another advantage of content marketing is that it doesn’t cost anything except for your time. Since we were bootstrapped, this was key. The first couple of posts that we wrote on the blog were pretty terrible. They lacked the necessary keyword research, they were way too promotional, and simply didn’t provide any value. Subsequently, they didn’t bring any traffic. Eventually, I figured out that a lot of people were searching for information relating to the Bootstrap framework. To figure out which topics people were searching for, I combed through the official Bootstrap docs and started entering various topics into the keyword planner. I discovered that people were searching for things like “Bootstrap carousel” and “Bootstrap contact form” yet nothing good had been written on the subject. Because the competition was pretty low at the time, we didn’t have to do a ton of link building. Writing in-depth articles and doing some basic promotion was enough to rank them. Through our content, we were able to dominate the search engines for most things relating to Bootstrap. In addition, I also wrote a blog post on where to get free stock photos that went viral. You can read about that case study here. Here’s a look at the traffic we were generating from the blog. Thanks to our content marketing efforts, we were starting to generate backlinks to individual blog posts. As a result, our overall domain authority started increasing and our rankings for our money keywords started climbing higher and higher. Next thing you know, we were ranking on the first page of Google for money terms like Bootstrap themes and Bootstrap templates. This lead to a steady rise in organic search traffic which ultimately lead to sales. For more info on how to optimize your pages, check out this guide from Moz. The last piece of successful marketing we did for BootstrapBay was starting an affiliate program. Anyone who referred customers to us received a 10% commission on the sale. We noticed that there were a lot of Bootstrap websites that were releasing free Bootstrap themes. Joining our affiliate program allowed them to monetize their sites. Collectively, our affiliates generated $37,500 in sales for us. In addition, getting links from all of these affiliates also increased our domain authority and improved our SEO. BootstrapBay was a phenomenal learning experience and generated enough revenue so I could quit my day job to go all-in on entrepreneurship. First, we validated the business idea using search volume data from the keyword planner. Next, we built the website and recruited theme authors through cold email. Finally, we marketed the business using content marketing, SEO and affiliates. I'm the co-founder and CEO of Snappa. I love writing about marketing and growing startups. This is a real big lesson! What I love about this case study is that you weren’t using any “secret” hacks or “shady” techniques. I mean the conventional marketing/growth strategies can work surprisingly well if you execute them well. A lot of people prefer to invest their time looking for some magic strategy while all they really have to do is put in hours of work. Thanks Tim. In my experience, putting in the time definitely works better than searching for the next ‘hack’. Great work, Christopher! May I know what affiliate program you used for BootstrapBay at that time? If it was a wordpress plugin, then you still need to promote it, right? We created our own system at the time. However, there are plenty of 3rd party apps that I’d use rather than build out our own system if were today. It will save you time and it also makes you more trust worthy to your affiliates. We’re using LeadDyno for Snappa. Hope that helps. Thank you, Chris! Did you promote your affiliate program? I mean how would potential affiliate people know and join your program if they didn’t know it before.